Thanks for this post. 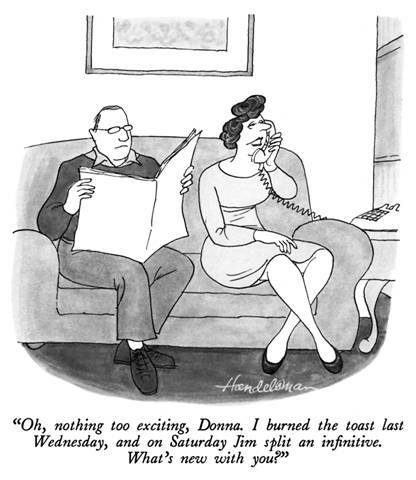 It’s aggravating some people obsess over split infinitives. Their mental energy should be redirected to other matters like audience, purpose, and genre. Thanks for your kind words. I encourage you to use WordPress. It’s free and easy to learn. It also offers you options for customizing as you learn more. The phrase ‘due to’ is misused in the third sentence; its proper use requires a helping verb (was due to). There is always more to learn about the English language, even for ‘pros.’ Live long and learn. – I don’t personally see the error. This is an interesting point and I’d be curious to see how and where you would insert the ‘helping verb’ “was”, as you put it. We already have the verb “originated”, so surely an additional verb would be incorrect?